The company is well-established as one of Europe’s leading printer brands, in terms of value and units shipped. For over 60 years OKI Europe has been delivering advanced printing solutions worldwide, introducing ground-breaking technologies that support the needs of businesses large and small. 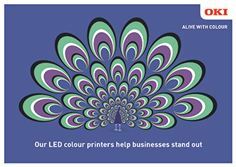 Our pioneering development of digital LED printing technology has placed OKI at the forefront of the market, delivering high-definition, eco-friendly printing devices that include large-format multifunction printers for fast, high-quality results in reprographics, engineering, architecture, CAD and mapping applications. OKI’s unique strength in large format solutions also extends to inkjet printers that deliver a stunning quality of printing and design on an incredibly broad range of media for the signage and graphics industries. Today OKI Europe employs approximately 600 people in 20 locations (sales offices and production sites) and is represented in 60 countries throughout the EMEA region.